An Indiana Senator (and Grace College online student) read a resolution Tuesday (March 12, 2013) in the Indiana Senate honoring the 75th anniversary of Grace College and Seminary, Winona Lake, Ind. 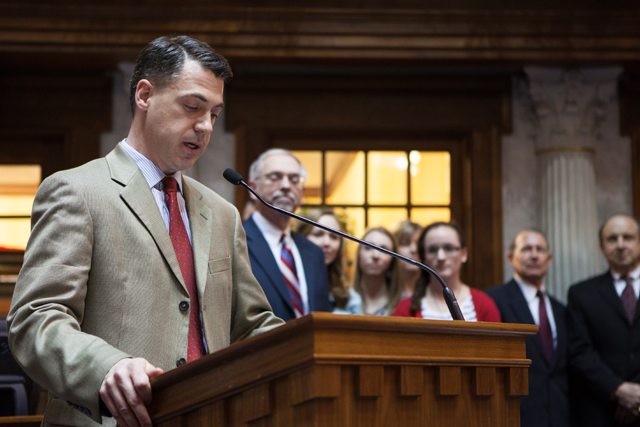 Senator Jim Banks, who was born and raised in nearby Columbia City and South Whitley and is currently pursuing his MBA from Grace College’s online program, noted the history of Grace College and Seminary as well as several of Grace’s outstanding achievements. The resolution also highlighted Grace’s recent implementation of more affordable education options for students. Senator Banks represents Indiana’s District 17, which covers Wabash County and portions of Whitley, Huntington, and Grant counties (all except Grant County are adjacent to Kosciusko County, where Grace is located). Representatives from the college were present in Indianapolis for the citation. Dr. Ronald Manahan, president of Grace and Dr. Bill Katip, provost, along with Brian Ramsey, site director of Weber Indianapolis; Tom Dunn, chief operations officer at Grace; Jennifer Anderson, student services coordinator at Weber Indianapolis; Dr. George Slaughter, professor of Psychology; Dr. Jared Burkholder, assistant professor of American and World History, and several students from Grace’s main campus in Winona Lake and Grace College Indianapolis. Also in attendance was Senator Ryan Mishler, long-time partner with Grace College and Seminary and representative of the 9thDistrict Senate (in which Grace is located), who spoke on behalf of the college on the senate floor.